Our company has acquired one of the top most positions in the industry for offering a wide range of Luxury Coaches (Minimum 5200 MM Or Bus Length Above 9 Mtr). These coaches are especially designed to serve the purposes of family tours and trips. Our Luxury Coaches are highly acclaimed by the clients for their hi-tech designs, luxurious facilities and many other features. The passengers of these coaches get maximum comfort and space. 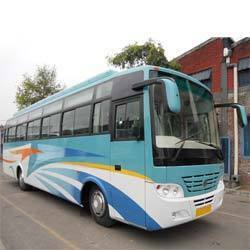 Sutlej Motors Limited was incorporated in the year 1974 and proved its competency as the leading Manufacturer and Supplier of Buses. Our product range comprises of Airport Buses, Sleeper Coaches, High Tech Luxury Coaches, Luxury Coaches and School Buses. Our range is designed and developed using best components sourced from reliable sources. Our excellent experience of many years has given us the better understanding of industrial working and helps us to serve the clients appropriately. Our range stands high whereas quality is concerned and we make sure that the manufacturing is carried out in accordance with the prescribed quality norms and safety standards. Our experts ensure that buses made by us have longer service life.